You don’t automatically think of going to a wine bar for Sunday brunch, but Online Editor, Simon Wittenberg, did exactly that. 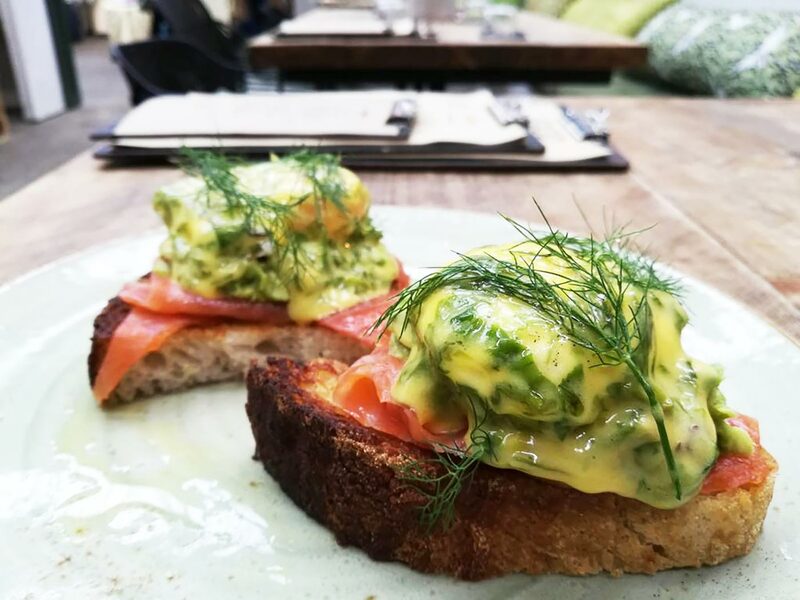 BOTTLES, which opened earlier this year on Brushfield Street in London’s Old Spitalfields Market, launched a weekend brunch menu in October in partnership with the in-house pop-up restaurant concept, SOOD Family. 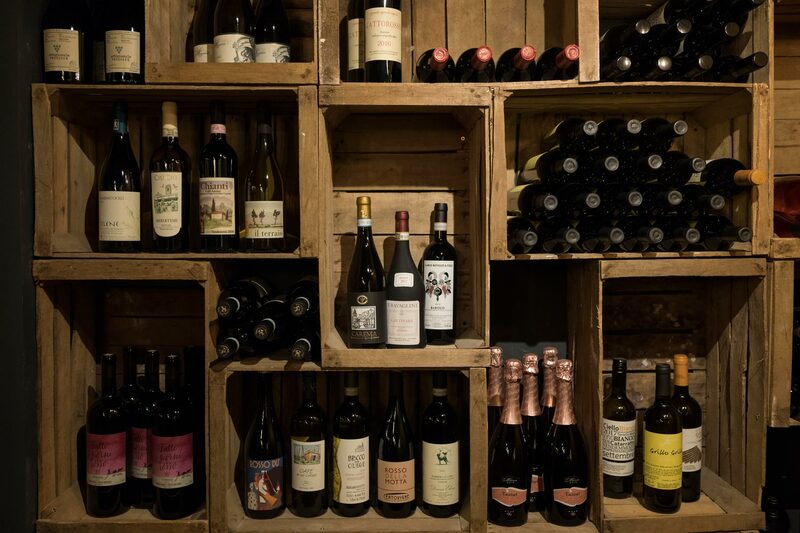 BOTTLES is a joint venture by the Italian food and wine experts, Franco Mancini and Daniele Marano. 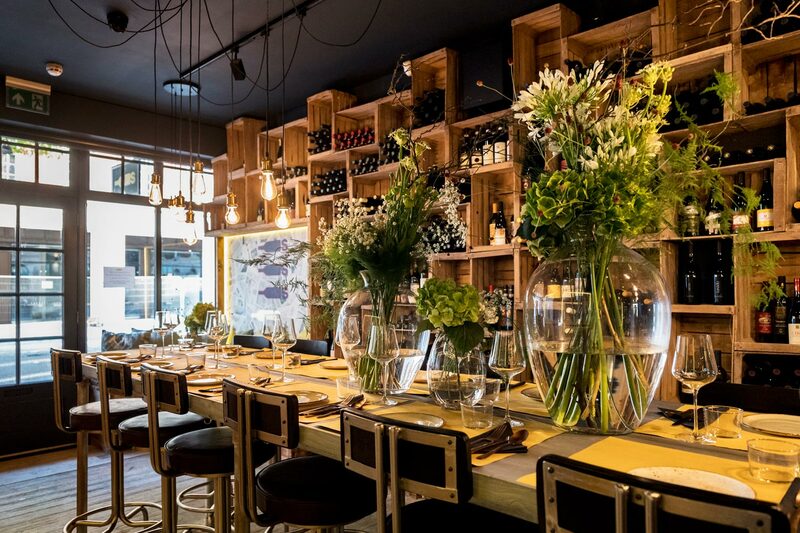 The two-storey unassuming wine bar, which comes complete with its own floral terrace by the market, is a relaxed and buzzy space that’s wholly dedicated to the enjoyment of fine food and wine. 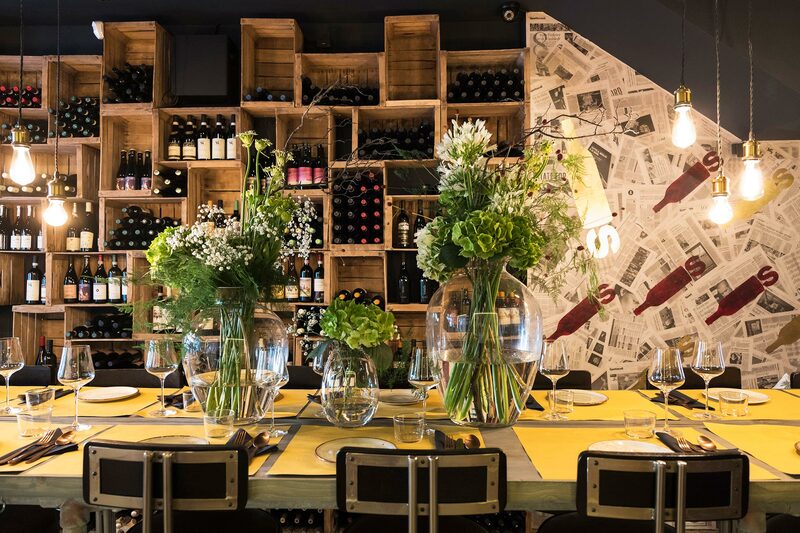 At street level, the elegant décor is made up of printed Italian newspaper articles, low hanging ornamental light bulbs, exposed brick, and plenty of wine bottles for sale (as you would expect from the name of this eatery). Guests are invited to sit on the high stools at the one long and shared wooden table in the centre of the bar, where you can literally rub shoulders with other diners, or there is additional seating up against one of the walls or next to the window by the Brushfield Street entrance. The brunch menu, which is served between 11:00 and 16:00 at the weekend, is very brief with only four dishes to choose from, but it’s accompanied by the à la carte for those who have a decent appetite. However, to satisfy a good dose of hunger, one plate on its own won’t really suffice. As you would expect from a beverage point of view, there is an extensive wine list, plus a few aperitifs, alongside a brief selection of soft drinks and tea and coffee. To kick things off, I enjoyed some steaming mulled wine (£6) to warm up on what was a fairly chilly day, whilst my other half opted for a refreshing Franklin & Sons orange and grapefruit juice (£3.50). From the brunch selection, I tried the oak smoked salmon and avocado on toast, which came with poached eggs that were full of flavour, seaweed and a delightful orange hollandaise sauce (£11). 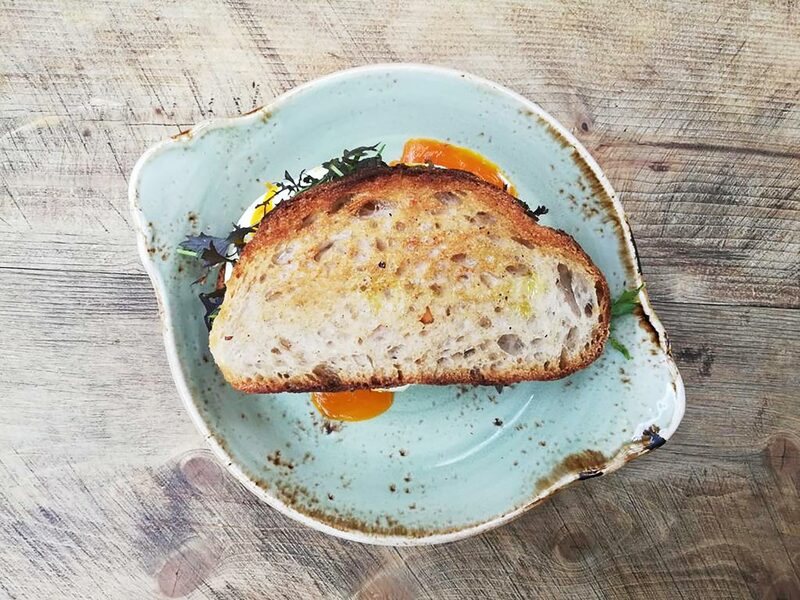 Other dishes that I could have had were namely a fried egg sandwich with guanciale (an Italian cured meat), mozzarella, roasted garlic and chilli mayonnaise (£8.50), or a potato frittata with pepper fennel and dill salad (£8). My guest headed for the Swaledale beef bavette bruschetta with gherkin and shaved truffle (£10.50) from the main menu, which was just as tasty. At BOTTLES, the service is friendly and fairly quick, and is also accommodating of any specific dietary requirements. 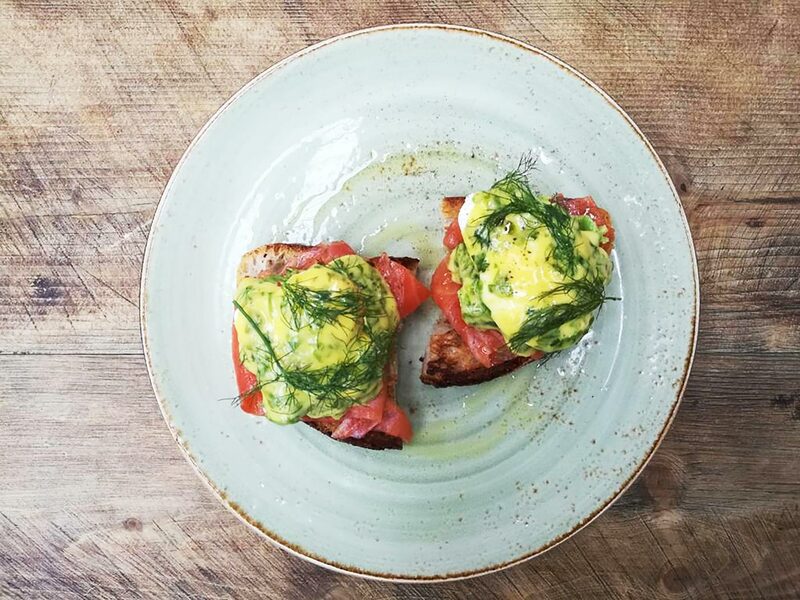 Eating brunch in a bar is an interesting concept, and it’s a relaxed environment amongst the buzz of the market in which to see friends, have a good natter and put the world to right before embarking on another working week. BOTTLES Wine Bar – Where and How? 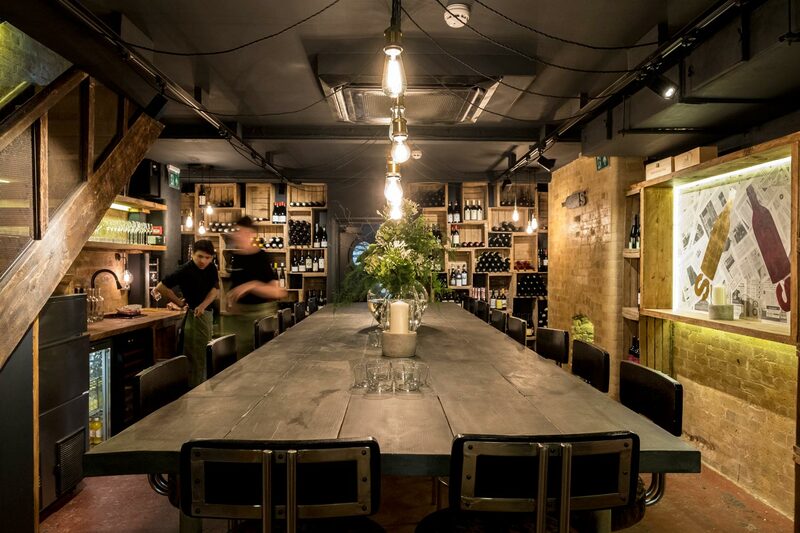 BOTTLES Wine Bar is located at 67 Brushfield St, London E1 6AA, United Kingdom. For more information, visit www.bottleswine.bar. On the 3rd December between 7 pm and 11 pm, SOOD Family will be holding a Truffle Supper Club at BOTTLES. They have put together a delicious feast to celebrate this sought after delicacy, showing-off the truffles’ incredible diversity, alongside a selection of incredible hand-picked wines to match from the in-house sommeliers. Tickets priced at £150 are available here.